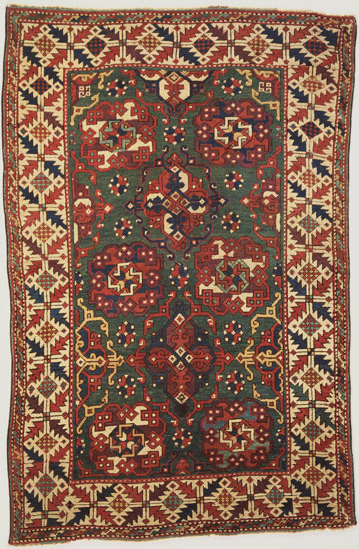 This is the finest example in an American collection of the Turkish "wheel rugs," so named in European inventories of the fifteenth and sixteenth centuries for their wheel-like pattern of octagons filled with interlaced geometric forms. 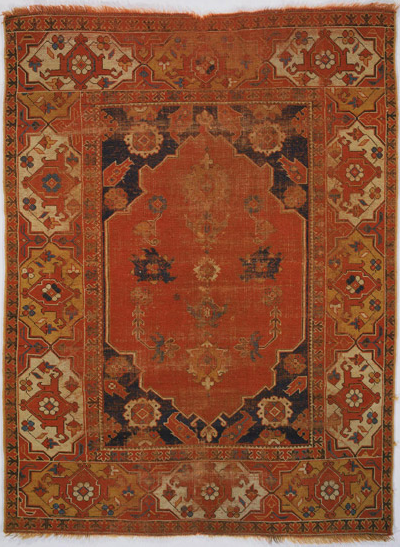 The pattern can also be found in many Spanish rugs and European paintings of the period. 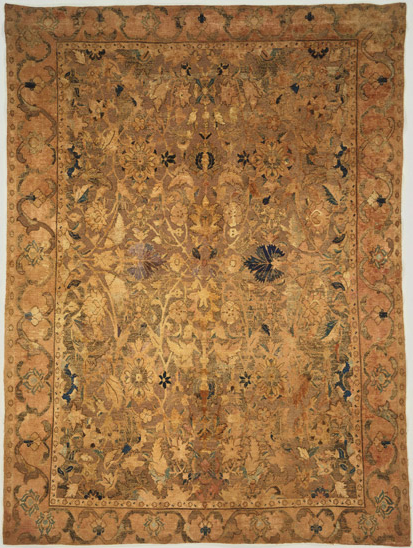 The characteristic delicate, lacy pattern of this rug is named for the Netherlandish painter Hans Holbein the Younger, who reproduced it in paintings between 1527 and 1543. 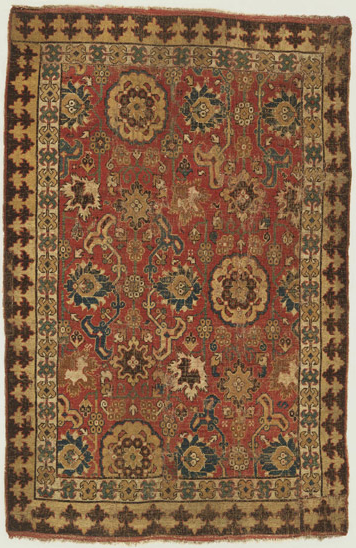 Though still in common use today, the term “Holbein” rug is misleading because it was not used by Turkish weavers and this type of carpet was first depicted by European painters long before Holbein was born. 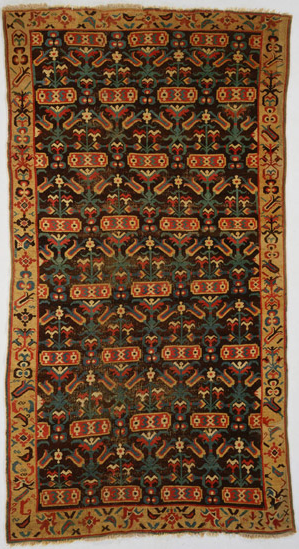 This unusual pattern of geometrically arranged floral motifs, brightly colored against a brown-black background, is reminiscent of the designs on Turkish ceramics. 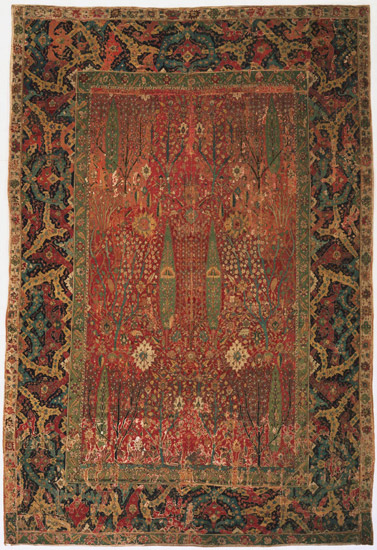 The "Lotto" pattern of arabesque forms in this carpet may derive from Persian silk textiles. The term "Lotto" came into use after rugs with this pattern appeared in paintings by the sixteenth-century Venetian artist Lorenzo Lotto. 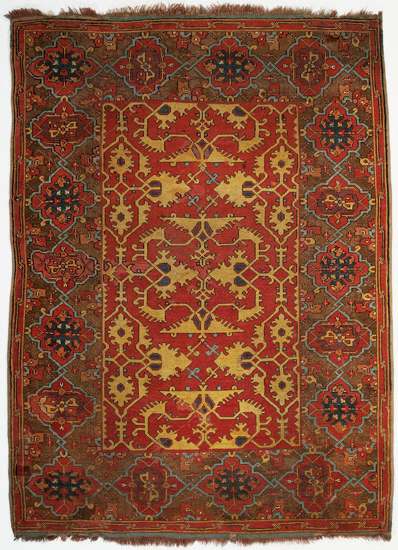 "Lotto" is a term of convenience for the repeated pattern of arabesque forms used in many sixteenth- and seventeenth-century Turkish rugs. 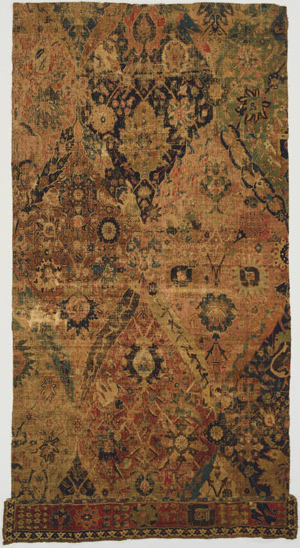 The term is taken from the name of the sixteenth-century Venetian artist Lorenzo Lotto, whose paintings depict rugs with this pattern. 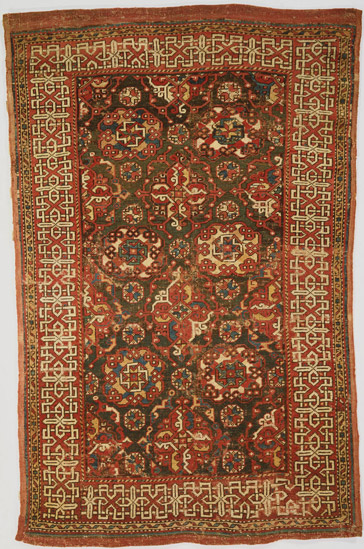 This carpet’s pattern of eight-pointed star medallions and diamond forms makes it an especially attractive example of the Ushak weaver’s craft. 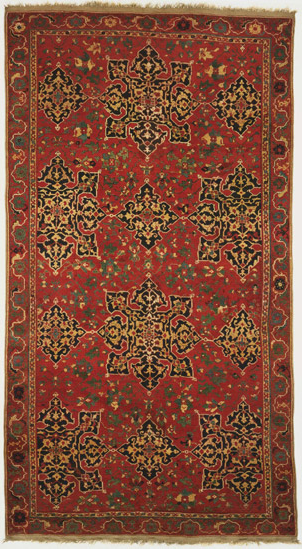 The design on this carpet is the only known complete example of alternating large quatrefoil medallions and smaller diamonds. 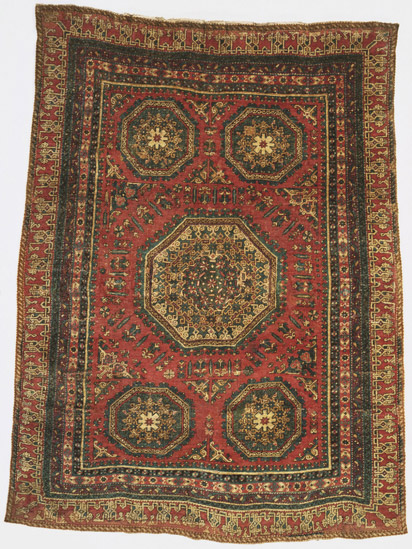 The medallions on this rug take the form of the octagram, an eight-pointed star. 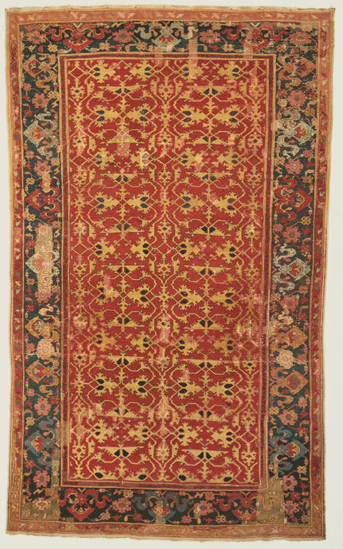 This carpet remains one of the finest examples of its type, despite numerous reweavings and fading. 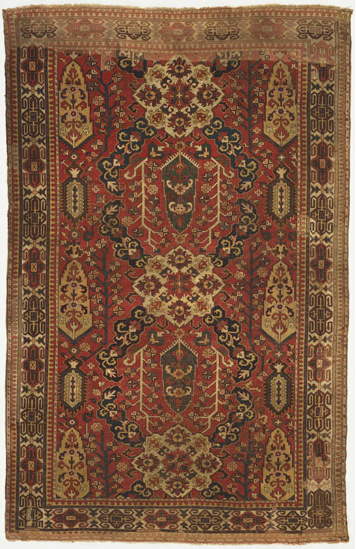 The complex pattern of floral motifs and arabesques, with two types of medallions in rows, testifies to the skill of the weavers. 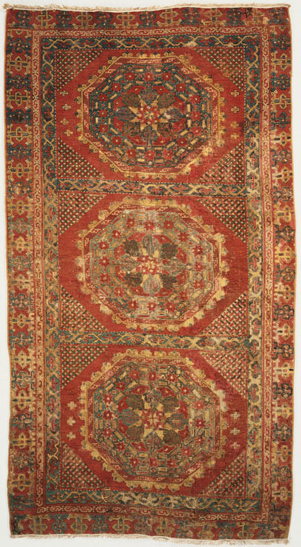 When complete, this rug was dominated by a pointed oval medallion, the lower half of which can be seen here. 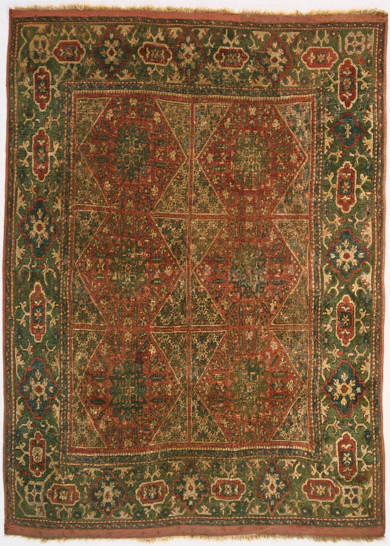 A mosque lamp hangs in one of the two opposing arches of the central field of this rug. 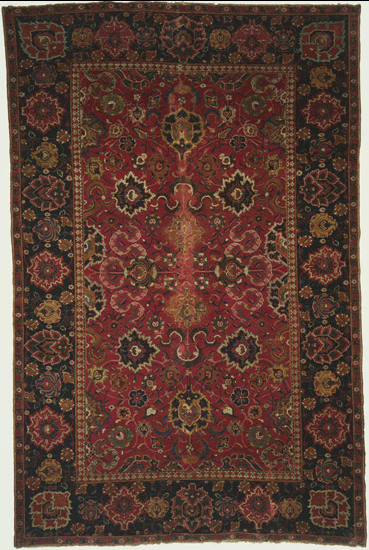 Small rugs of this type were used for kneeling during prayer. 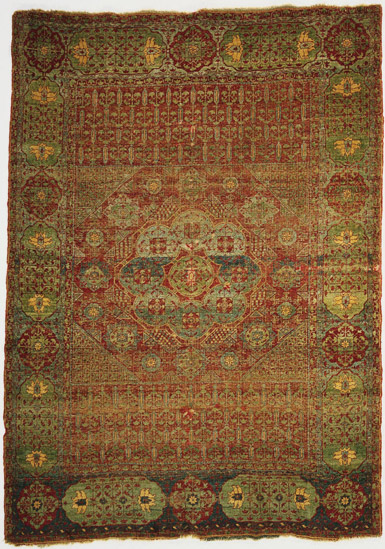 Chintamani is the name for the East Asian Triple Jewel symbol and is used for Turkish rugs covered with rows of three small circles, one atop the others, above one or two wavy lines. The pattern may have also been based on the leopard spots and tiger stripes of Central and East Asian royal furs. 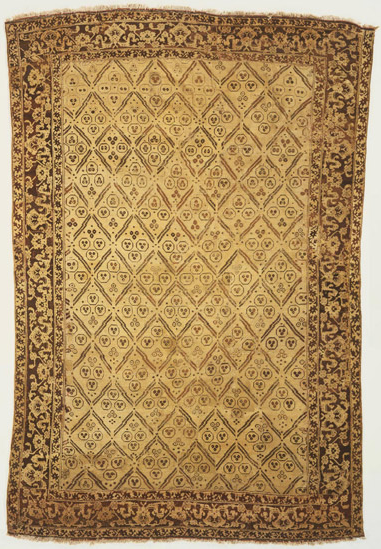 The stylized leaf forms on this white-ground rug have been thought to resemble hummingbirds, thus leading to the term "bird" rug. 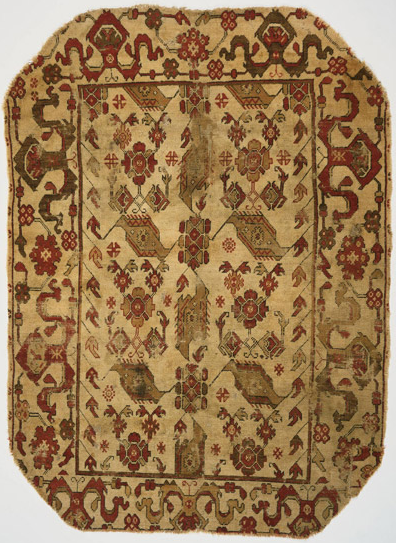 Many small “bird” rugs of this type have been found in Protestant churches in Transylvania, where they were used to decorate benches, corridors, and the like. The corners of this rug may have been cropped for some architectural purpose. 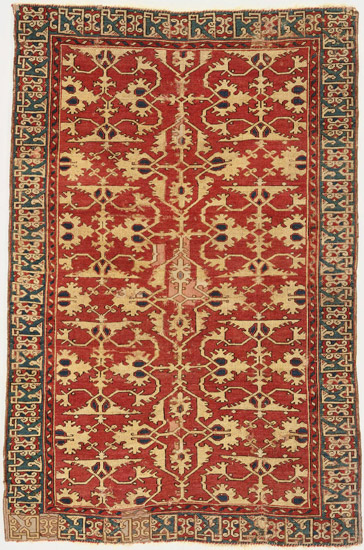 Shortly after the Muslims of North Africa introduced the art of making twisted-pile carpets into Spain, the weaving of this armorial carpet was undertaken. It was probably made for the founder of the royal house of Castile, Fadrique Enríquez, who held the titles of Lord of Medina and Admiral of Castile and was the grandfather of King Ferdinand of Spain. His coat of arms—an upright lion beneath two triple-towered castles bordered by anchors and ropes—is repeated three times in the center field. 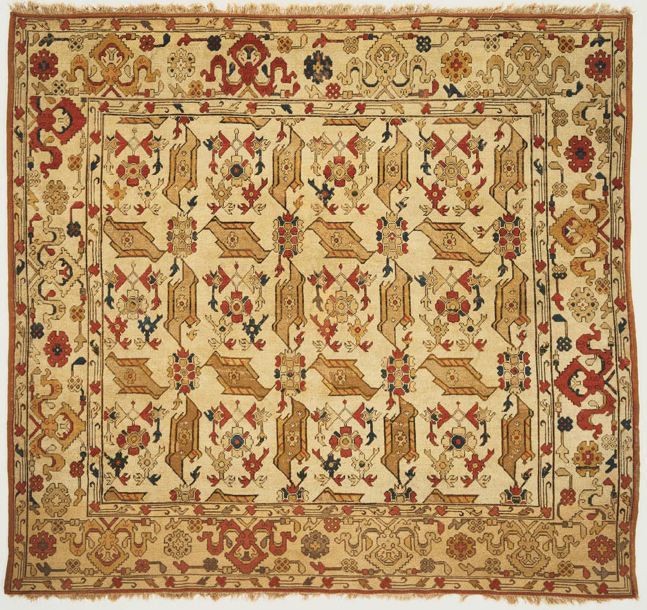 A decorative pattern in the main border at each end, formed by designs that resemble Arabic script, indicates its Mudéjar workmanship. 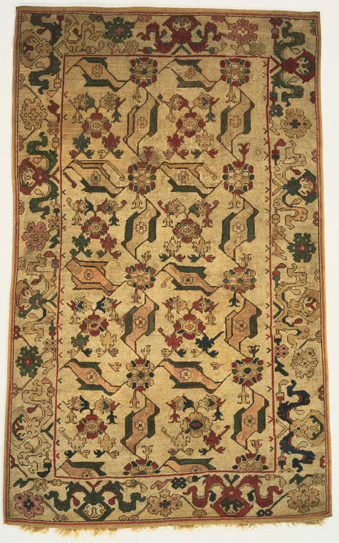 This rug shows some of the changes in design between the rugs woven in Turkey (Anatolia) and Spain in the sixteenth century. Here, three laurel wreaths in blue-green replace the pattern used in the "wheel rugs" of Turkey. 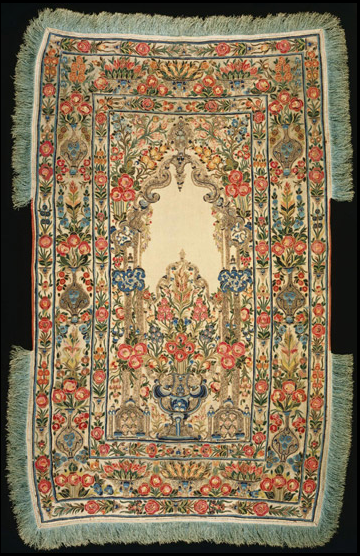 The floral border has been borrowed from Renaissance textiles, and the coral color, produced from a dye newly imported into Spain from Mexico, replaces the red normally used in Turkish rugs. 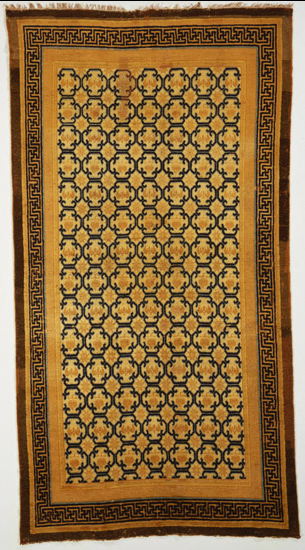 "Ogival lattice" refers to the vine and leaf pattern marked off by ivory lines on this rug. 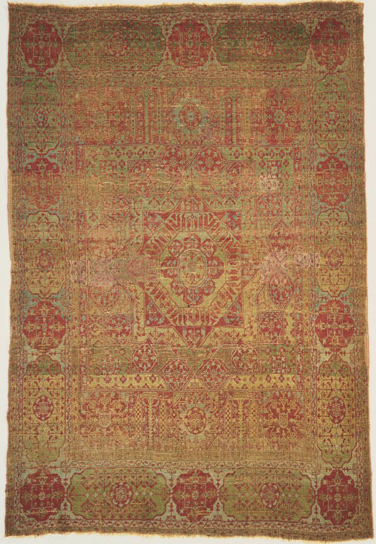 Due to fading of the dyes, the lattice pattern has lost much of its original prominence. 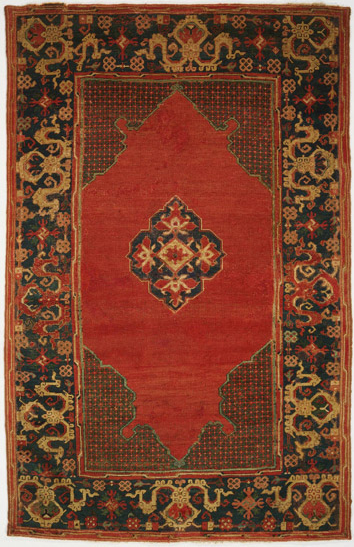 Mamluk carpets are characterized by a central, dominant octagonal medallion surrounded by a great variety of smaller, geometric motifs. They take their name from the Mamluk dynasties that ruled Egypt from 1250 through 1517. 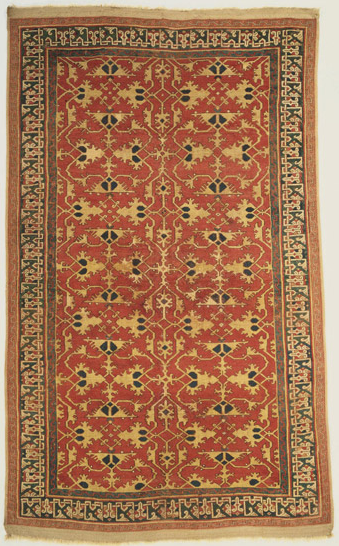 Carpets of this design were produced in Cairo, largely for the southern European luxury trade. 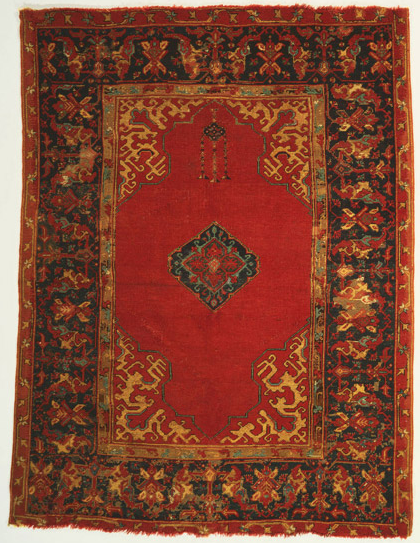 Among the Egyptian Mamluk rugs that survive, the design of this rug is quite unusual. Its peculiarity lies in the central group of nine rondels, reminiscent of mandala arrangements in East Asian art, and in the prominent yellow-white lotus blossoms, also of Asian origin, in the border. 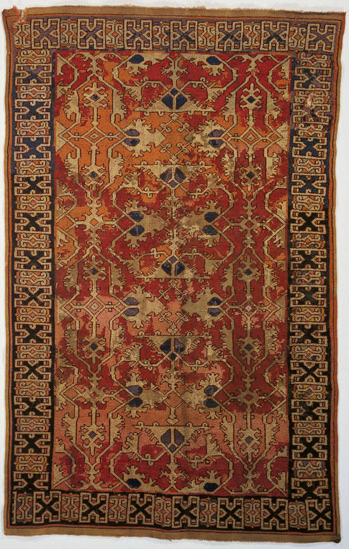 The design on the Weld of this carpet—hexagons placed in a continuous grid of rectangular compartments—as well as the border design, is thought to be inspired by the older Mamluk rugs of Egypt. Artist/maker unknown, Iranian, Persian, Kurdistan? 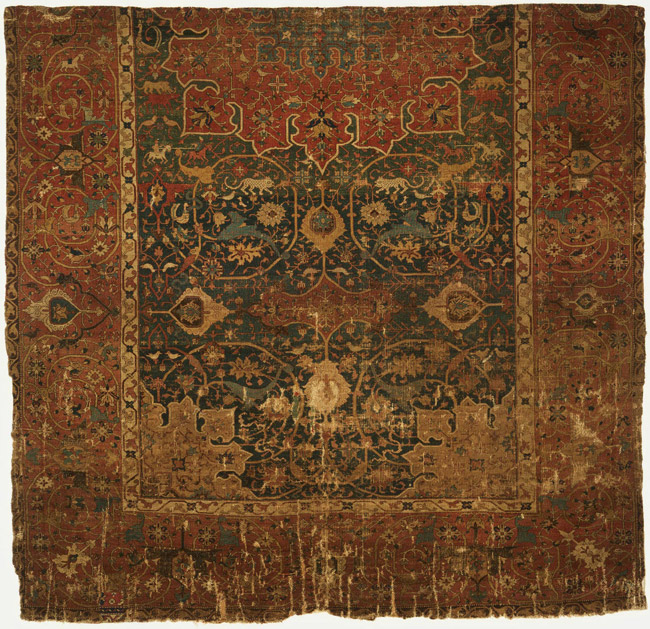 This is the only known dragon rug that has been knotted in the Persian manner. 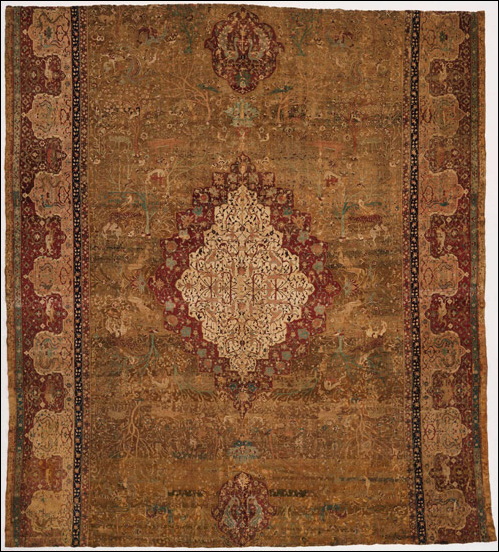 The last twelve inches of the carpet, woven in the opposite direction from the rest of its length, is also an unusual structural feature. 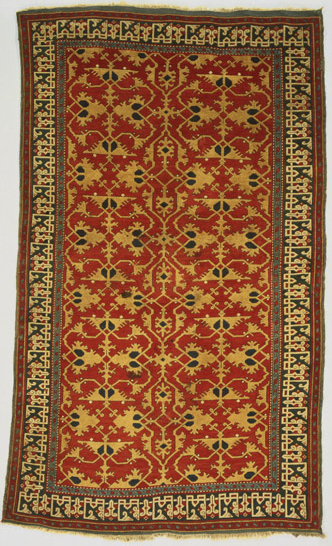 This may be because the weaver was migratory and had to remove the carpet from the loom in order to move. 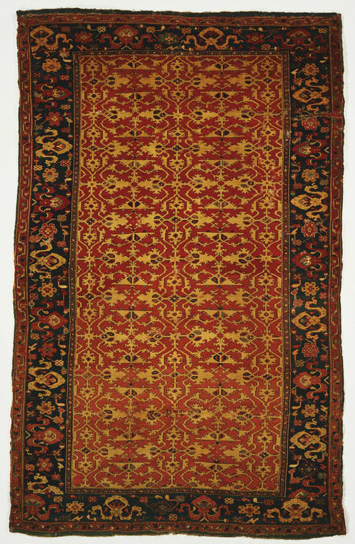 When the weaving resumed, the rug was mounted on the loom in the opposite direction. 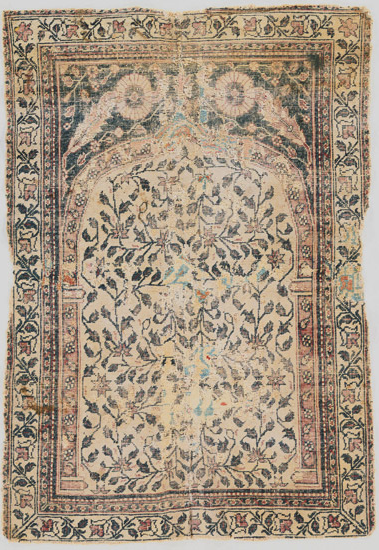 Stylized, column-like cypress trees in blue-green separate the ivory-colored plaques in the center of this rug, while yellow cypresses alternate with elongated hexagons along the sides. Cypress trees were a popular symbol of eternal life because they stay green year-round in the arid climates of the Middle Eastern countries. Two pairs of stylized, yellow dragons appear within the larger red panels on either side of the central axis. 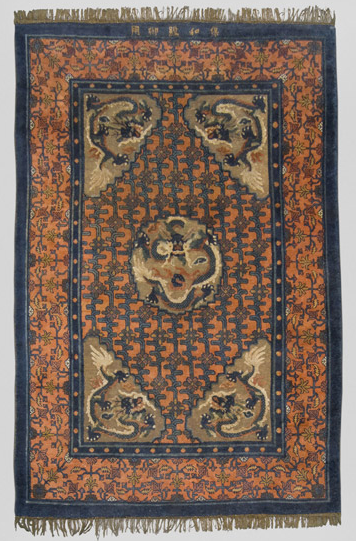 Three pairs of stylized, black-brown dragons are the focus of this bold and striking carpet. 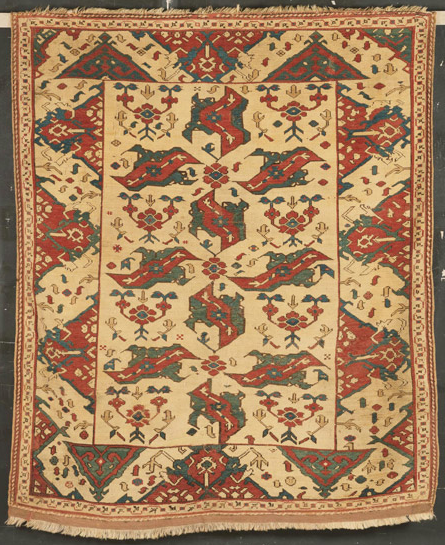 The dragon motif originated in China and became widely known from Persian miniature paintings. 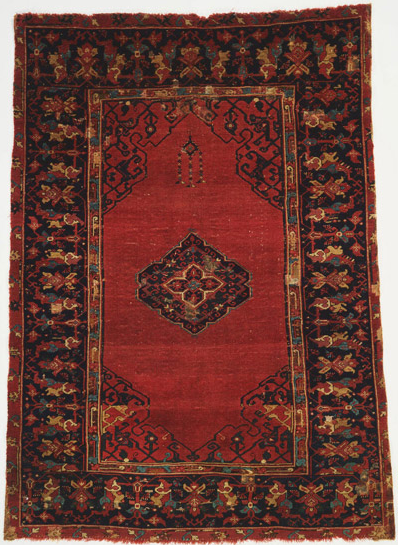 Para-Mamluk carpets were probably made in Anatolia, in workshops founded by craftsmen trained in the Mamluk carpet traditions of Egypt. They share some Mamluk details in their design, most notably rows of small trees and plants arranged around a central octagon. 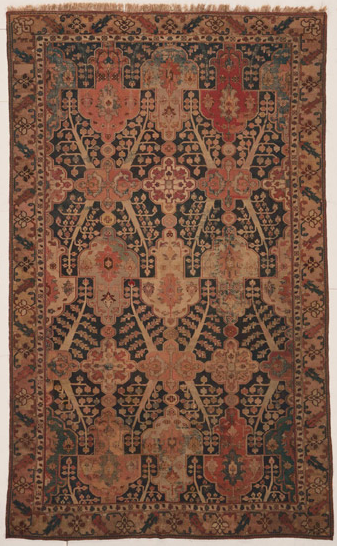 One of the oldest surviving examples of its type, this rug shows a field of leafy or pomegranate-bearing trees arranged between rows of geometric compartments. 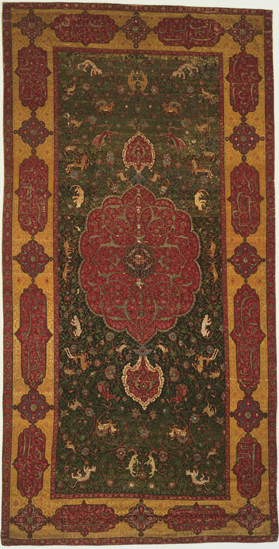 The design for this carpet, depicting a royal pleasure garden and hunting ground with a myriad of plants and animals, must have been created by an artist versed in the Persian miniature painting tradition. 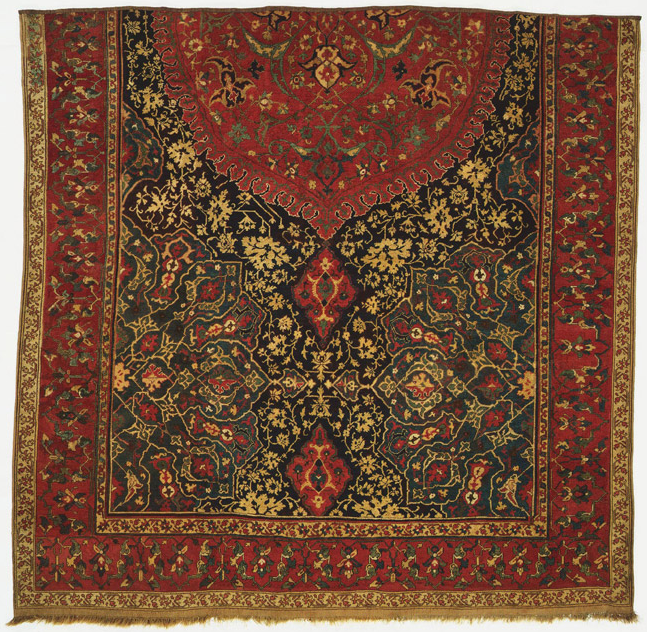 The diamond medallion in the center has no close parallel among surviving rugs from Persia. 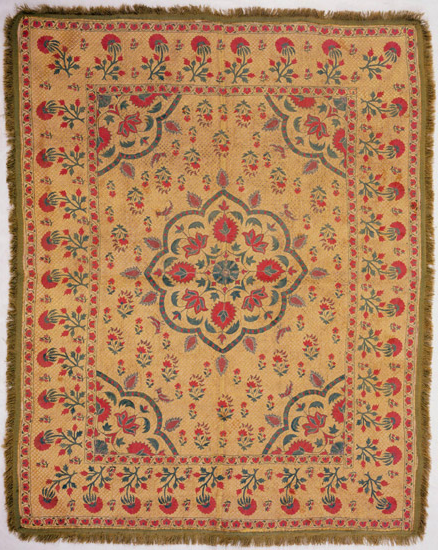 Conventionalized floral border surrounding central floral medallion. 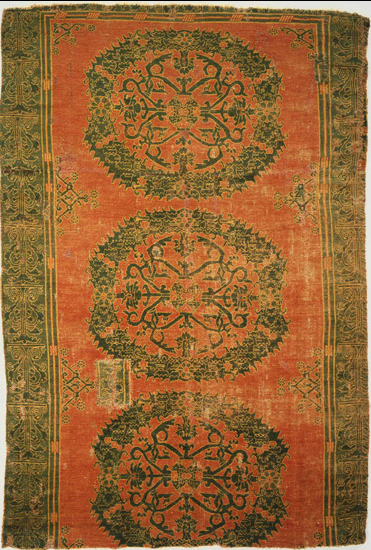 This fragment of a seventeenth-century imperial Mughal summer carpet or floor spread was formerly in the collection of the Amber Palace near Jaipur, India. As was the practice with furnishing textiles in royal collections, it was inscribed upon entering the palace with its size, date, and price, and marked again during periodic inventories. The inscriptions on the reverse of this fragment indicate that the floor spread was first inventoried on April 7, 1690, when its cost was listed as 21 rupees, 12 annas; a second inscription records that it was still in use on September 6, 1701. 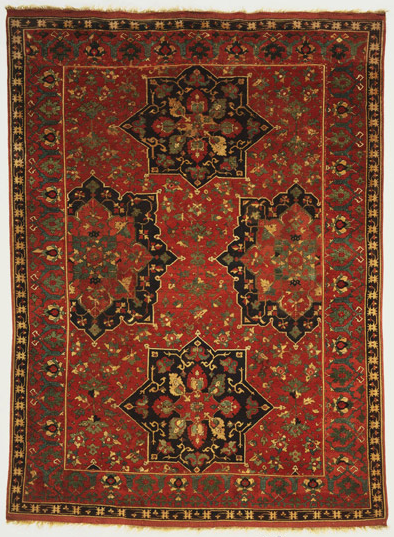 A third of its original size, the Museum's carpet consists of a floral-patterned field bordered on three sides with a different floral fabric. 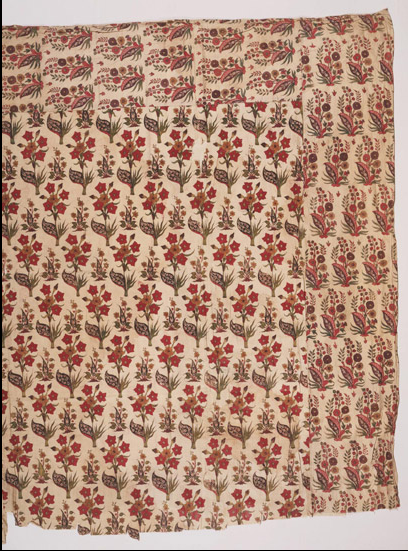 The designs on both the field and the border, like those on other high-quality Indian chintz textiles of the period, were drawn and painted by hand, and show a repeat of formal flowering plants symmetrically arranged against plain backgrounds in patterns that are typical of Mughal decoration beginning in the early seventeenth century. Dilys Blum, from Philadelphia Museum of Art: Handbook of the Collections (1995), p. 74.